Clement C. Moore was born in 1779 in New York City and went on to become a philanthropist and professor of theology and ancient languages. He was the father of nine children, for whom he often wrote poetry. Niroot Puttapipat grew up in Thailand, the grandson of a Thai princess. He has had a lifelong interest in art and literature and is the illustrator of THE MUSICIANS OF BREMEN. He now lives in London. Candlewick. Hardcover. GOOD. Spine creases, wear to binding and pages from reading. May contain limited notes, underlining or highlighting that does affect the text. Possible ex library copy, thatâll have the markings and stickers associated from the library. Accessories such as CD, codes, toys, may not be included. Candlewick Press, 2007. Hardcover. Very Good. Disclaimer:A copy that has been read, but remains in excellent condition. Pages are intact and are not marred by notes or highlighting, but may contain a neat previous owner name. The spine remains undamaged. The dust jacket is missing. At ThriftBooks, our motto is: Read More, Spend Less. Candlewick Press, 2007. Hardcover. Acceptable. Disclaimer:A readable copy. All pages are intact, and the cover is intact. Pages can include considerable notes-in pen or highlighter-but the notes cannot obscure the text. At ThriftBooks, our motto is: Read More, Spend Less.Dust jacket quality is not guaranteed. Candlewick Press, 2007. Hardcover. Very Good. Disclaimer:A copy that has been read, but remains in excellent condition. Pages are intact and are not marred by notes or highlighting, but may contain a neat previous owner name. The spine remains undamaged. At ThriftBooks, our motto is: Read More, Spend Less.Dust jacket quality is not guaranteed. Candlewick Press, 2007. Hardcover. Good. Disclaimer:A copy that has been read, but remains in clean condition. All pages are intact, and the cover is intact. The spine may show signs of wear. Pages can include limited notes and highlighting, and the copy can include previous owner inscriptions. The dust jacket is missing. At ThriftBooks, our motto is: Read More, Spend Less. Candlewick Press, 2007. Hardcover. Good. Disclaimer:A copy that has been read, but remains in clean condition. All pages are intact, and the cover is intact. The spine may show signs of wear. Pages can include limited notes and highlighting, and the copy can include previous owner inscriptions. At ThriftBooks, our motto is: Read More, Spend Less.Dust jacket quality is not guaranteed. Candlewick. Used - Good. Former Library book. Shows some signs of wear, and may have some markings on the inside. Candlewick. Used - Very Good. Great condition for a used book! Minimal wear. Candlewick, September 2007. Hardcover . 7.5 Bulk HB Standard. Candlewick. Hardcover. 0763634697 Please allow 4 - 14 business days for Standard shipping, within the US. Thank you for supporting our small, family-owned business! . Fair. 2007-09-25. Pop. Candlewick, 2007. 1st Edition . Hardcover. Near Fine/Near Fine. STATED FIRST Edition AND Printing with publishers full number line in place. 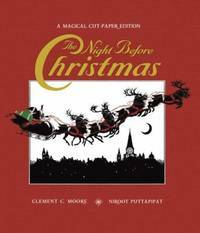 A Fabulous cut-paper edition of this holiday classic. A Near Fine volume (bumped upper rear crown edge), in a Near Fine UNclipped dust jacket,( due to an approx. 1/2" chip to top rear panel edge of jacket.) 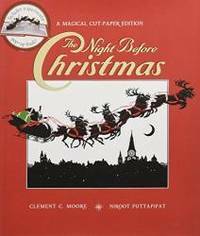 A two-page black and white pop-up on last page of Santa's sleigh rising into the night. Printed on stiff card. 20 pages. Mylar protected jacket. 2007-06-07. Good. Ships with Tracking Number! INTERNATIONAL WORLDWIDE Shipping available. May not contain Access Codes or Supplements. May be ex-library. Shipping & Handling by region. Buy with confidence, excellent customer service! Candlewick. Hardcover. 0763634697 Like New Condition. . Fine. Candlewick. Hardcover. 0763634697 New Condition. . New. Candlewick, 2007-09-25. Pop. Hardcover. Used:Good.